Apologies for the delay in posting this month’s winner. The three judges deliberated for a long time the night of the event–at least it was a warm and sunny evening so we could do so outside!–so I guess it only makes sense that the announcement would be the long time in coming. Congratulations to Pam Russell Bejerano, who wrote the following in 36 minutes! Margaret stood looking at the bicycle in the shop. It was the latest invention – the front wheel large with iron spokes, a tiny seat atop made of wood, and one small wheel behind. She had seen many photographs of them, but this was her fist glimpse in person. It was magnificent. Margaret smiled. She knew women were not allowed to ride such contraptions, but she also knew that this was hogwash. Women of a certain age, in her opinion, were young enough to be able to break such asinine rules, and old enough to enjoy doing so. How little the young knew. “No,” she said, then quickly corrected herself. “Actually, yes. I am looking for a bicycle for my husband. But truly, you cannot convince me that these contraptions are not highly dangerous.” She shifted her parasol from one shoulder to the other, getting a better look at both the boy and the bicycle. “No, no,” he said walking to the bicycle and wheeling it towards her. “They are truly safe. Watch,” he said, stationing the bicycle by the mounting stand. He climbed up, swung his leg over the seat, and placed his feet on the pedals. “Watch,” he said, then proceeded ever so slowly to move the bicycle down the road. She watched him go, then watched as he turned the corner ever so carefully, and rode back to her, dismounting again at the stand. He smiled at her, as if it were the grandest achievement to have ridden such a thing between here and there, when in truth, here was there. Thoughts swimming in Margaret’s mind were of a much grander sort. “I supposed you’re going to tell me I need to purchase the contraption to mount the thing as well?” she said, goading him. “And this?” she said, pointing to the rod. “Watch,” he said, beaming at her. As he rode away, the stand flipped itself up. Again, he rode to the end of the dirt road and turned slowly, then made his way back. How he would dismount was the only piece of information she was lacking. She watched carefully as he slowed the bicycle, removed one hand from the handle bar and placed it on the seat between his legs, then quickly leapt back and down to the ground. “My boy, if I have to ask you again, you shall lose my attentions permanently.” She stared him in the eye, unmoving. “75 pounds? And 10 shillings?” she mocked, feigning shock. “For a contraption that will make one sweat to take it simply down the road?” she said, gesturing up the short distance of road she had traveled. “Yes, just as I thought. An overpriced bundle of metal to get one no where.” She shifted her parasol off her shoulder and overhead, turned on a heel, and began to walk away, smiling. She knew she had him. “And where might that be?” she said, feigning ignorance. “There?” she pointed down the road she was facing that bent some 100 yards down into the overgrowth. A back road, she also knew, that led to Sussex, some 16 miles away. Insulted as a woman, and by her age. It was amazing how well the youth managed to do that in one fell swoop. She smiled, thoroughly enjoying herself. “Are you quite through?” she said simply. “Good, because you’re tiring me. I want that one.” Again she pointed to the larger model still in the shop. Unfortunately for the poor lad, by the time he was right back, she had hoisted up the folds of her skirt, mounted the cycle, and disappeared around the bend. Once out of sight and out of sound, she realized she had done it – she had fled her godforsaken life forever, and had done so in the most unexpected of ways – by bicycle. She lifted her head to the sun, flew her feet off the pedals and out in front of her, and let out the most joyous, giddy yelp of her life. 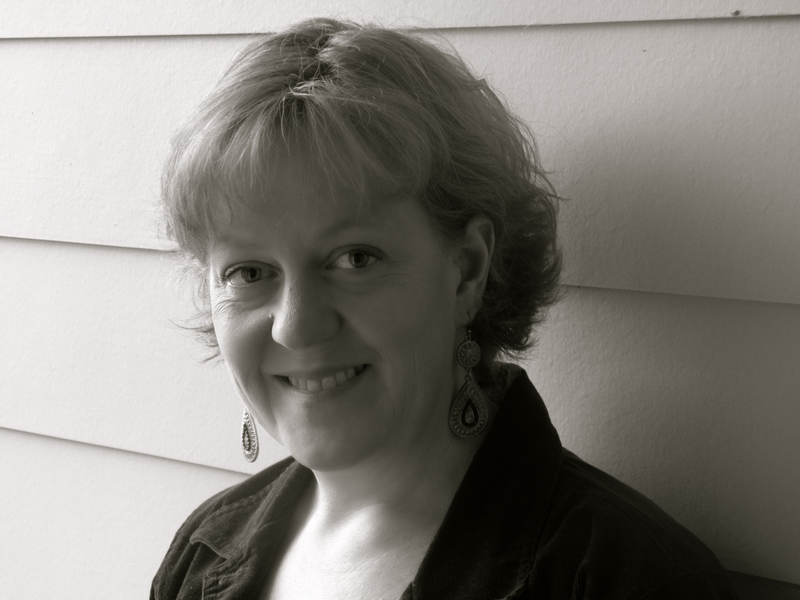 Pam Russell Bejerano is a writer who works as an educator in Portland, Oregon. Pam has published a poem and one previous Mini Sledgehammer story, and was invited to read a short story at the Cannon Beach Historical Society. Pam is currently working on a novel to be completed in 2011. You can read more of Pam’s writing on her blog. I love the way you capture the language of the times. I also love the subject you chose. What fun!!! Congratulations!